The country’s only commuter train is cheap and reliable. Zimbabwe’s rail network was built under British colonial rule, and at its peak in the 1990s had 600 locomotives and 3,000 passenger carriages. 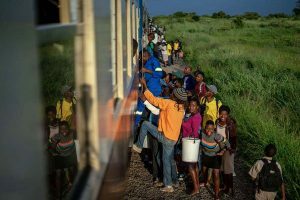 BULAWAYO, Chugging through townships, maize fields and scrubland as the sun rises, Zimbabwe’s only commuter train is cheap and reliable — two qualities that its passengers cherish in a downwards-spiralling economy. “We had to re-furbish old carriages to get this service going, and it has been a huge success,” Mr Maravanyika told AFP. Lets see how long this ZANUPF propaganda lasts comrades ?